An area between Belltown and Pioneer Square is being marketed by the Downtown Seattle Association as the West Edge. 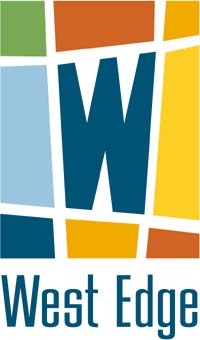 The logo for the West Edge neighborhood. What makes a downtown hot? A lively atmosphere of cultural diversity, history, arts and entertainment, nightlife, residential living, varied retail, phenomenal restaurants, cafes and pubs, a fantastic waterfront with cruise ships and ferries, dynamic employees and people, people, people! Also, it must be clean and safe, with an unforgettable personality. Most cities can’t brag about this, but we can in Seattle, especially downtown Seattle. Our downtown is fast becoming a notable destination and what makes it memorable are its unique neighborhoods like Belltown, Pioneer Square, the Retail Core, Denny Triangle, International District, the Waterfront — and — First, Second and Western avenues. What neighborhood was that again? The First, Second and Western avenues neighborhood is located between Belltown and Pioneer Square. It runs from Western to Third Avenue and Lenora to Cherry. It is home to recognizable names such as the Pike Place Market, Benaroya Hall, Seattle Art Museum and Harbor Steps. It includes many entrepreneurial shops and furniture stores that make the neighborhood one of the most eclectic in downtown. It also has a large residential base. But now, thanks to the efforts of the area’s businesses, the neighborhood has a name — the West Edge! Why the West Edge? West Edge is a name that is geographic — located on the west edge of the downtown hill — and represents a spirited attitude, which describes the independent merchants and arts venues. The area has seen its share of ups and downs, and revitalization efforts have been slow compared to other areas of downtown. Yet many merchants in the area have been in business for many years, determined to make it a successful business community. Therefore, under the auspices of the Metropolitan Improvement District (MID), a property owner-supported 225-block downtown improvement operation, a volunteer committee was formed of a diverse range of members to strategize on how to market the neighborhood. The committee received an amazing 45 percent return, with an overwhelming number choosing to name the neighborhood the West Edge. Being a place brand carries many benefits. Customers perceive brands as having quality and a name they can trust, knowing their experience will be a good one. Customers are also willing to pay a premium price for a brand and generally remain brand loyal over a lifetime. Essentially, it can help downtowns differentiate so they can compete with suburban destinations and malls looking to mimic what downtowns have. Destinations that have been successfully place-branded include Disneyland, Beverly Hills, New York, New Orleans and London. These places exhibit a “WOW” factor, providing the ultimate customer experience that is unforgettable and encourages customers to visit more often, buy more, dine more, and overall, experience more. Through branding, which brings out a brand’s distinct personality, a bond is created between the customer and the place, generating enthusiasm for what is offered. The West Edge has plenty to offer and the name implies “There is nothing dull about it!” Its brand promise to customers is that they will experience a sense of adventure while enjoying the neighborhoods spirited, energetic, hip, entrepreneurial aroma. Once officially adopted, promoted and known, West Edge will grow to mean different things to different people. Customers determine the popularity of a brand, what it means to them and identify with the whole experience, not just with the name. West Edge’s target customers include local residents and employees, visitors and tourists who desire to experience the intimacy owner-operated boutiques can provide, original products, fresh farm produce and arts. A challenge, however, will be to manage the brand experience so it won’t take on a life of its own. Otherwise the vision will be lost. Plans for an official launch of the West Edge brand will take place on Sept. 7 at Harbor Steps during one of the Downtown Seattle Association’s renowned “Out to Lunch” concerts. The launch will include a look at West Edge signage, featuring the new logo, and walking guides identifying neighborhood highlights, shopping and dining information. Merchants in the area will have the opportunity to promote the new name by including West Edge signage in their shops and on their advertising and communications. Funding for the launch, promotional materials and marketing guidance was provided by the MID. The MID, created and managed by the Downtown Seattle Association, pays for maintenance, safety, research/development and marketing services designed to make downtown Seattle clean, safe, vibrant and economically healthy. Each neighborhood within the MID was provided with $30,000 per year over five years to market their neighborhoods. The MID also provides funds for destination marketing, a regional effort to bring visitors to downtown. Destination marketing complements neighborhood marketing and both are essential in promoting the unique attributes of downtown Seattle. At DSA, I direct a dynamic team of professionals, and together we bring 30 years of marketing, branding, communications and event experience to the table. Our next effort will be to guide the place brand process for downtown Seattle and the MID Retail Core neighborhood. The Retail Core, known for its national and international retail brands, theater, fine dining and topnotch hotels, sponsored this year’s “Pigs on Parade” public art event and fundraiser for the Market Foundation. Watch for more to come on the increasing excitement of downtown Seattle as the place brand to be in this millennium. Sylvia McDaniel is director of marketing and communications for the Downtown Seattle Association.